UPDATE: the Detu F4 Plus’ price has been announced at $2600 (excluding rigs). See also new sample photos below. At IFA Berlin 2017, Detu announced a new professional camera, the Detu F4 Plus, an 8K 360 camera. Here are its specifications and features. 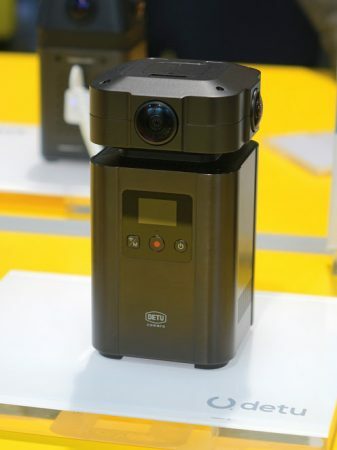 Detu is a Shenzhen-based company that has a line of 360 cameras ranging from the hemispherical Detu Sphere 800 ad Sphere S, the fully spherical Twin, and the prosumer Detu F4 with 6K video. 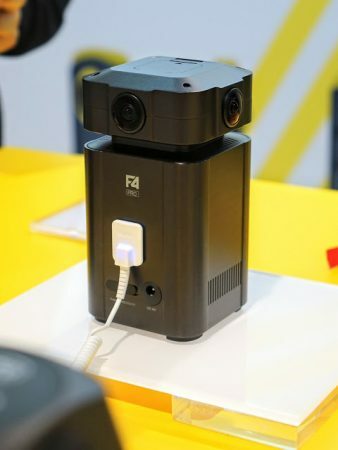 Detu is now expanding its line with the F4 Plus, which appears to be a renamed version of the F4 Pro (it’s also possible that the F4 Pro is a still-higher model). I first saw the Detu F4 Plus at CES 2017 (that’s where these photos are from). Back then, it was called the Detu F4 Pro, and Detu representatives would not reveal anything about it at all. The only thing we knew was that it had four lenses, and presumably had higher image quality than the Detu F4. The Sony IMX117 sensor is the one used in the GoPro Hero4 Black and some other action cameras. While it might not be a cutting edge sensor, I’m expecting decent performance, although probably not as good as that of the GoPro Omni (which is also 8K but has six GoPro Hero4 cameras). Another feature is that it is designed for long recording times. It has an aluminum body and cooling vents to help radiate heat. Here are official sample photos from the F4 Plus in various conditions: indoors, outdoors, and in low light. The F4 Plus will be $2600. By comparison, Detu F4 is around $1600. 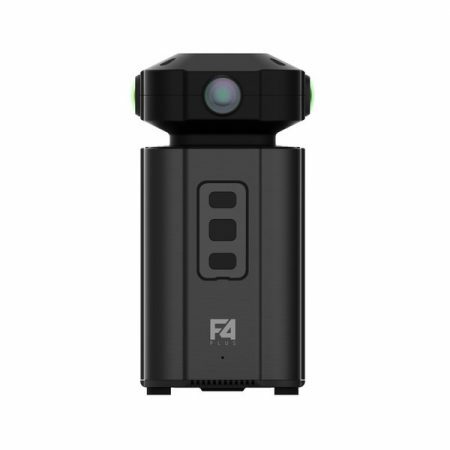 At $2600, the F4 Plus is now the lowest cost 8K all-in-one 360 camera. I also don’t know yet if it includes stitching software. Here is the official page. Thank you very much to RotoStudios, Jim Jensen (Google Photo Sphere Community), and VJ Luna for bringing this to my attention! Yes good observation, VJ. So far other than Insta360 Pro, I don’t know of any other professional 360 video camera that uses only one memory card. Interesting how the Fusion used separate cards too. Maybe it’s just better for performance….? I liked the photo results, Michael. Thanks Ramon. I am guessing that Moore’s law has an application to cameras as well. So I estimate that in 2018 5.7K will be “normal” for consumer 360 cameras, and toward the end of 2018 or beginning of 2019, I expect to see 8K 360 cameras for consumers, and 16K 360 cameras for middle-tier professional cameras. There will be 360 8K cameras in the $1000 price range within a year. These companies cannot outpace the speed at which technology, competitors and price get crunched. The speed at which new cameras come out is accelerating too fast. By the time most of these cameras are finally developed and put into production, there is already another, better, for half the price. This is a very tough business..
Hi pannee. You’ve actually used the Detu F4 Plus? Can you share a link to your samples?